This chapter argues that the definition of law proposed from legal positivism influences interpretations of political action through its dismissal of legal claims that question state authority. It is argued that this leads toward methodological nationalism . 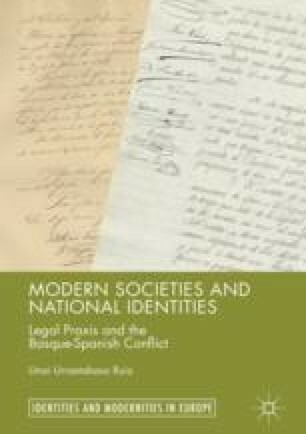 Legal realism and legal pluralism are proposed as alternative approaches to develop a more nuanced, empirical, and critical understanding of the relationship between social and legal theories. A brief overview of legal realism brings to the fore its main features, and the work of Harold J. Berman illustrates how such a perspective can have an effect on concept of society. Legal pluralism is introduced as a different yet converging perspective. The focus is placed on authors such as Lauren Benton, whose work provides an alternative analytical context to study the meanings of legal disputes, and Paul Halliday, whose analysis illustrates the different kind of sociological analysis that the perspective can produce. Burgess, G. (2009). Filmer, S. R. (1588–1653). In Oxford Dictionary of National Biography. http://www.oxforddnb.com/view/article/9424. Accessed 21 Sept 2014.